CURRICULUM VITAE Enzo Aiello is an artist of mosaic. He was born in Petrona’, Italy, in 1963. He currently lives and works in both Rome and New York. He creates original works and is also highly-skilled at restoring antique mosaics. He studies Painting at ACCADEMIA DI BELLE ARTI, Roma, Italy. Work/study. VATICAN STUDIO of MOSAIC, Vatican City, Italy. MICROMOSAIC IN SMALTI FILATI He learns the technique of Micromosaic in Smalti Filati, a prestigious antique technique that developed in Rome between the XVI and XVII centuries. In the 1700s it was used by the Reverenda Fabbrica di San Pietro of the Vatican to replace all the oil paintings that were being damaged by humidity in the Basilica of St. Peter with exact, detailed copies in mosaic that we can still admire today. The material used in smalti filati is glass. The mosaic artist melts different pieces of colored glass in a pot under a flame and amalgamates it with two pricks. Once the glass melts, the artist continues to work it under a flame with flat-nose pliers and stretches it into rods 15 to 20 inches long to a desired thickness of sometimes less than one millimeter. After they dry, he cuts these rods to a desired length and can then insert these tesserae in the glazing putty. With this technique, the artist can make not only large-scale mosaics but also miniature mosaics that may depict very detailed scenes (of monuments or roman views) for jewelry and precious objects. This technique is known by only 30 artists in the world today. Work/study. SCUOLA MOSAICISTI DEL FRIULI, Spilimbergo, Italy. INDIRECT METHOD He learns a technique in which the artist glues the tesserae face down with a water-soluble glue on sections of paper that he prepares in advance by cutting up an actual-size drawing of the mosaic’s composition. When the glue has dried, the sections can be turned up and installed in the site they were planned for. This technique makes it possible for the artist to create very big mosaics for floors, walls, chapels, domes, and swimming pools. Usually the stones do not exceed 1 or 1.5 cm (1/2 in) thick. Work/study. ALBE STEINER Studio, Ravenna, Italy. DIRECT METHOD He learns the Byzantine technique, in which the mosaic artist, after having spread the lime cement, sets the glass stones (tesserae) directly in the lime cement. He embeds them at slight angles in order to reflect the light. The Byzantine mosaic method developed from the IV century A.D. to XV century A.D. and used tesserae of glass mosaic. The backgrounds in their mosaics were often gold glass tesserae. DIRECT METHOD ON TEMPORARY PUTTY He also learns the direct method using provisional putty, in which the artist sketches the drawing on the clay or the lime previously spread and then he inserts the tesserae in the clay. When the mosaic is completed, he glues a cheesecloth or a gauze (tarlatana) over it. After the cheesecloth dries, the artist removes the clay from the back of the mosaic while it is still attached to the tarlatana. Finally, he installs the mosaic in the site it was planned for. This method is used particularly in portraits, so that the artist can easily adjust the tesserae before fixing them permanently. He works on two large mosaic projects with other Albe Steiner students. One is a wall mosaic 1000 x 800 cm (800 sq ft) at the entrance of LUNA PARK-MIRABILANDIA, Ravenna, Italy and portrays the scene “The Celestial Jerusalem” from the Basilica of San Vitale. The other is a fountain mosaic about 30 sq m (300 sq ft) in piazza Dante, Ravenna, Italy. He moves back to Rome and exhibits his mosaics in group exhibition at ATHENA ARTE GALLERY, Rome. He collaborates with Rinaldo Piras on a project of making all the floor mosaics for the famous Italian fashion house REPLAY to be installed in their stores in Rome, Hong Kong, and New York. Using polychrome marble in the roman mosaic technique, he creates motifs of ornaments, Greek frets, and other emblems to create more than 100 sq m (1000 sq ft) of floor mosaics. SAVELLI GALLERY in Rome begins to represent him for 4 years. Collaborating again with Rinaldo Piras, he does a wall mosaic of approximately 15 sq m (150 sq ft) for CAPITANERIA DI PORTO DI ROMA, Fiumicino (RM), Italy. He exhibits a still life in a group exhibition at the ATHENA ARTE GALLERY, Rome. Using the roman mosaic technique, he creates a 12 sq m floor mosaic for the MAXY-GYM in Rome. He shows in the group exhibition at ATHENA ARTE GALLERY, Rome. Using the Byzantine mosaic technique, he creates a 15 sq m (150 sq ft) ceiling mosaic depicting a starry night sky for the FULVIMARI CHAPEL in Capitignano (AQ), Italy. He works with Rinaldo Piras and artists Kristin Jones and Andrew Ginzel on the prototype of a mosaic that depicts an eye for the project OCULUS. It measures 21 x 33 cm (8-1/4 x 13 in). 301 of these eyes are subsequently installed in the Chambers Street stop of the New York MTA subway. He visits POMPEI, Italy and his study of its mosaics and frescoes strongly influence his work. He makes his first trip to NEW YORK CITY on a commission of creating custom mosaics in a 5-story, 7,000 sq ft townhouse in the Upper East Side. For this, he makes two large mosaics using the roman mosaic technique. The first is a wall mosaic measuring 50 x 200 cm (19-1/2 x 78-3/4 in) that portrays Venus standing in a shell on a lake, at her left is the Vesta Temple and at her right the Canopo in Villa Adriana. It decorates the wall adjacent to a large 8-person jacuzzi reminiscent of the famous thermal baths frescoes in Pompei. The second is a floor mosaic measuring 4 sq m (40 sq ft) for one of the bathrooms. It depicts floral ornaments and contains a central scene of dolphins jumping out of water. He does restoration of geometric floor mosaics using the roman technique in VILLA ADRIANA, TIVOLI, Italy and also restores antique floor mosaics for LEKYTHOS in Rome. FORTUNA FINE ARTS GALLERY commissions and brings him in New York to restore six very fragile roman mosaic panels of the III century A.D whose tesserae are 7mm thick. They come from Syria and are considered the most important mosaic archeological discovery in the last 50 years. Measuring approximately 30 sq m (300 sq ft) of roman mosaic. He moves to New York for the restoration which is long and particularly laborious. He travels frequently between Rome and New York. From his studio in via Pesaro, Rome, he continues working on commissions and making pictures in mosaic for his customers all over the world. He makes a 2 sq m (20 sq ft) wall mosaic of the city emblem of Vibo Valentia for the entrance of VILLA GAGLIARDI, an important, recently restored 17th century villa. FORTUNA FINE ARTS calls on him back to New York to restore another six antique roman mosaic panels that depict: 1. a saint, 1 x 2 m (45 x 94 in), IV century A.D.; 2. a saint, 90 x 190 cm (35 x 75 in), IV century A.D.; 3. a peacock, 90 x 180 cm (35 x 71 in), III century A.D.; 4. a fallow deer, 75 x 68 cm (30 x 27 in), III century A.D.; 5. a geometric floor mosaic, 70 x 90 cm (28 x 35 in), III century A.D.; and 6. a small fragment, III century A.D. The restoration process consisted first of breaking and removing 8 cm (3-1/2 in) of reinforced concrete that was too heavy and backed the mosaics from an earlier restoration. After liberating the mosaics from the weight of the concrete, he remounted them on a lighter surface. He restores a precious portrait done in micromosaic of polychrome marble tesserae not more than 2mm thick of an antique roman woman. The mosaic measures 20 x 30 cm (8 x 12 in) and comes from southern Italy., private collection,Munich, Germany. The artist Luca Buvoli commissions him to do a tri-color mosaic measuring 300 x 400 cm (10 x 13 ft) and using polychrome marble and glass paste tesserae mounted on honeycomb aluminium for the exhibit “WHERE IS THE VICTORY?” at the AUTORI CAMBI GALLERY directed by Matteo Boetti in Rome. The paninoteca VIA QUADRONNO commissions him to do a big mosaic for its new place in Tokyo and another large mosaic for its place in New York. 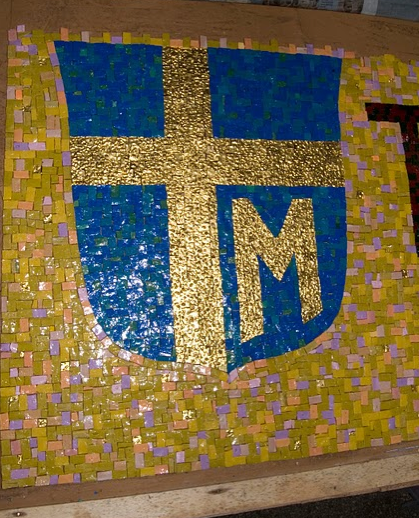 Using the Byzantine mosaic method of polychrome marble and glass paste, he makes a floor mosaic that portrays a sun for the private chapel of a entrepreneur in Munich, Germany. He makes a Baby Jesus , 10 sq feet,for the “Parrocchia Gesu’ Bambino” in Rome,via campi flegrei. He makes a big “Madonna” on the facade of the church “S, Maria delle Grazie” in Pietrasecca (AQ), Italy. He makes a 120 sq feet floor mosaic for the “Comunita’ Montana di Delianuova” at the Garibaldi museum in Delianuova, Italy.